Fuel strategy was good. I made an enormous pasta bake the evening before (enough for 6 people ), ate it for dinner that night, and for breakfast, lunch and dinner on the cycle. Had 1.5l of DIY sports drink (oj/water/salt/sugar), and a camelbak of plain water. Bought some sweets (see pics) towards the 100km mark when I thought it might prevent bonk, though I was still going strong – increasing speed in fact! The route was along the towpaths from Croke Park as far as Kilcock, then after that I was on the old N4 for most of the way. I’ve thought a lot about the next route that I’ll do, Dublin-Mayo, I’ll write up a new post for that in a couple of weeks. just read about your ride and we are doing something similar in July. Any chance you can give me more info about the route you took? This was the route I took. As you can see I left the canal towpath at Kilcock, although I intended to go further originally (MoyValley). The reason for that was the slow progress I was making on the soft grass parts of the towpath. If I was doing it again I’d go with fatter mountain bike style tyres rather than the thinner touring ones I had on the bike. What type of bike are you using for your trip? Thats awesome. Were hiring the bikes and I believe that they are hybrid style bikes (Giant’s I think) so we may try to avoid the soft grass. Cheers again for the advice. 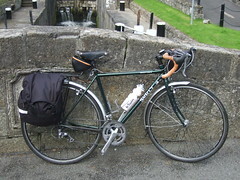 Just got back from doing the Liffey to Kellys Bridge -24k short of the Shannon- on Saturday. Its an easy enough ride but took 9 hours. Lots of gates over which bikes have to be lifted but the scenery and setting compensate. Killcock to Moyvalley is hard work but its easy after that. I could certainly have done the Liffey to the Shannon in one day (12hrs) had I started a little earlier, but my destination was allways Kellys bridge just beyond Ballynacargy. Contact me if you need details. looking to do Dublin to Galway on a Giant road Bike in May of 17. Need help with track. Yours is the best info I have seen. Any suggestions? Would like to get it done in two days max.